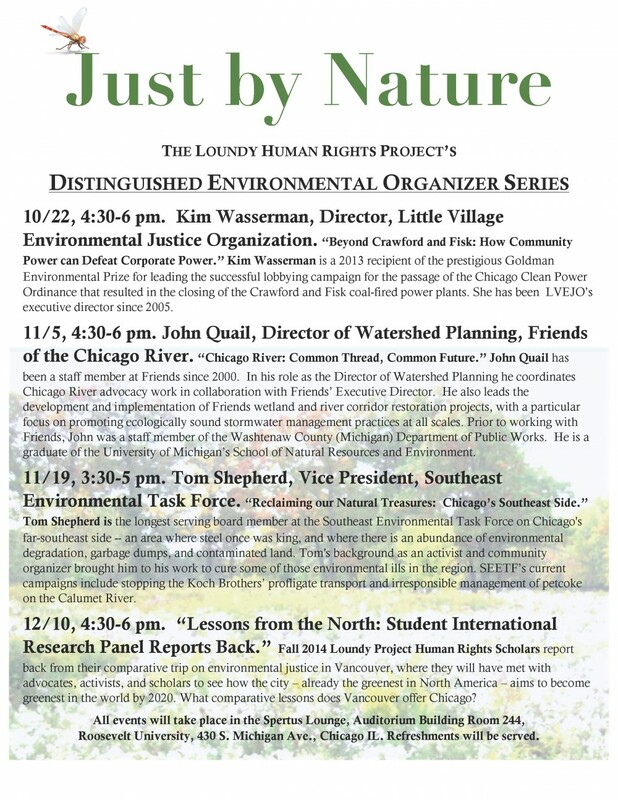 The Joseph Loundy Human Rights Project at Roosevelt University is proud to kick off its Fall Distinguished Environmental Organizer Series next Wednesday, Oct. 22, 4:30 – 6 p.m., with a special presentation by Kim Wasserman, Director of the Little Village Environmental Justice Organization (LVEJO). Ms. Wasserman (pictured at right) is a 2013 recipient of the prestigious Goldman Environmental Prize for leading the successful lobbying campaign for the passage of the Chicago Clean Power Ordinance that resulted in the closing of the Crawford and Fisk coal-fired power plants. 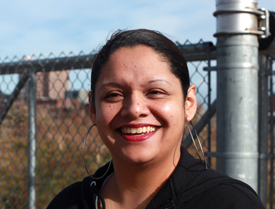 She has been LVEJO’s executive director since 2005. Wasserman’s presentation is entitled Beyond Crawford and Fisk: How Community Power can Defeat Corporate Power. Please join the Roosevelt community for this powerful conversation in the Spertus Lounge in RU’s National Historic Landmark Auditorium Building, 430 S. Michigan Ave., room 244. Refreshments will be served. For more information, contact Prof. Bethany Barratt, Director of the Joseph Loundy Human Rights Project (bbarratt@roosevelt.edu). See this flier (pdf) and the image below for future events through the Loundy Project’s “Just By Nature” series at Roosevelt this fall. This entry was posted in education, events, humanities, Illinois, policy, pollution, presentations, Roosevelt, social justice, waste. Bookmark the permalink.